Héctor Duarte, Gulliver in Wonderland / Gulliver en el país de las maravillas, 2005. Commercial paint on siding. Photo by Olga U. Herrera. Born in 1952 in Caurio de Guadalupe, Michoacán, Mexico, Héctor Duarte exhibited art skills as a child. While in his biology class in high school, executing drawings of organisms and animals, he discovered his talent and began considering an art career. Mostly a self-taught artist, he attended the Siqueiros Mural Workshop in Cuernavaca in 1977 under Luis Arenal and Roberto Díaz. 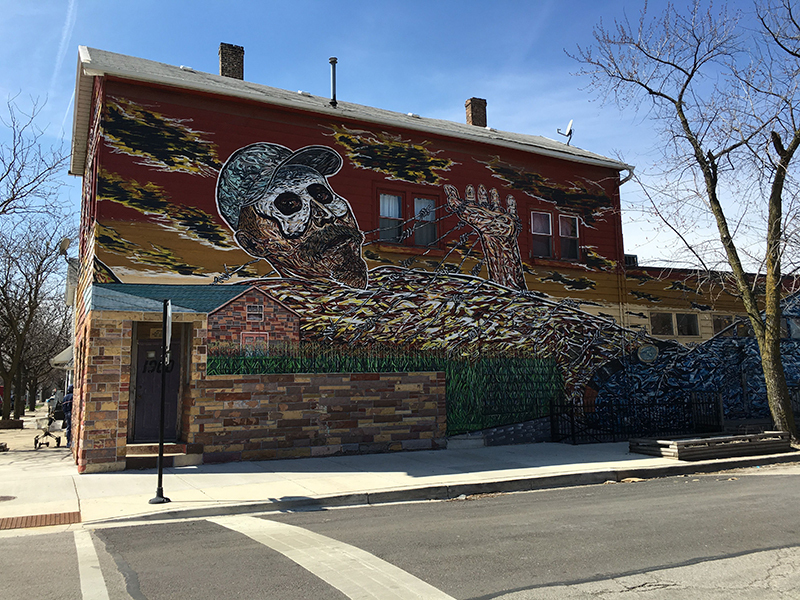 On a short visit to Chicago in 1978 to attend the international conference on community murals, Duarte became impressed with the vitality of a mural activity and community movement, which was transforming the Mexican neighborhood of Pilsen. There he met Chicano artists Ray Vasquez, Luis Aguirre, Marcos Raya, Aurelio Diaz, Oscar Moya, José Guerrero, José González, Alejandro Romero, Carlos Moth, Salvador Vega, and others involved with Casa Aztlán. 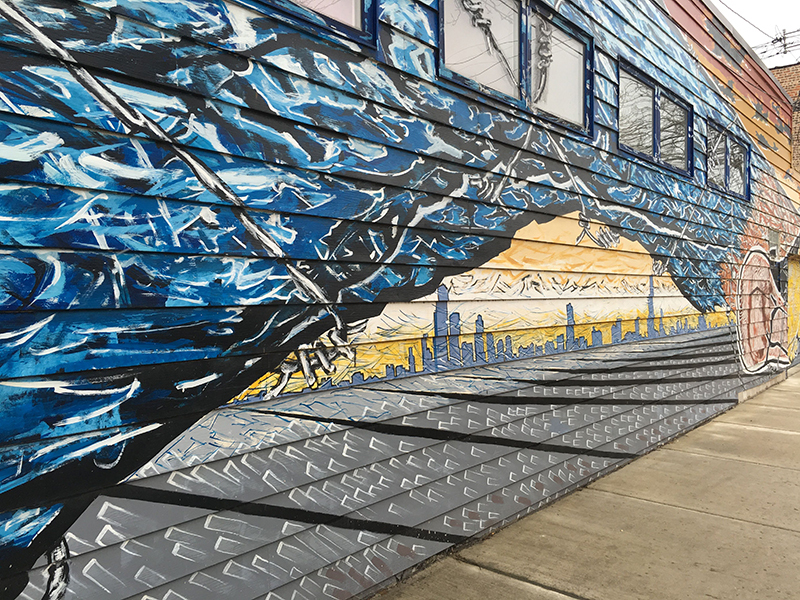 In 1985, Duarte settled permanently in Chicago’s Pilsen to become a full-time muralist. 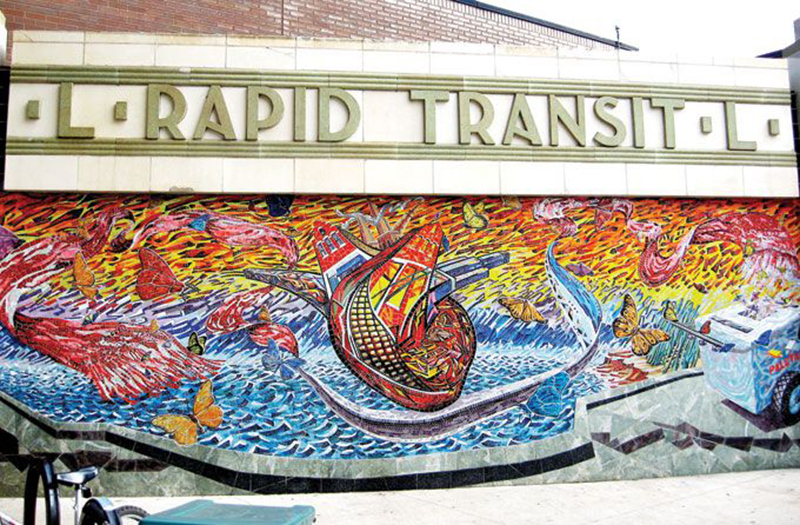 With a prolific artistic career, he has been part of the significant public art scene in the city; Duarte has executed over fifty murals in public and private spaces, including CTA train stations. Preoccupied with poly-angular perspectives in the mural pictorial plane, he became adept in designing compositions that can be appreciated from various vantage points. Perhaps one of his most effective outdoor murals is the facade of his residence and studio, where Duarte depicted Gulliver in Wonderland. A second iteration on the same theme (the first mural was destroyed), a giant migrant awakens and fights to unfetter his body from the barbed wires that restrain it; in this, the artist addresses the almost impossible journeys and lives of contemporary immigrants. Committed to the idea that art must be enjoyed by all, Duarte embraces muralism as his visual language to explore issues of struggle and survival, as well as a transnational condition of the global moment. Adopting the monarch butterfly as a symbol of migration, Duarte has established a path between Chicago and his hometown in Mexico, creating one of the most impressive transnational art corridors. 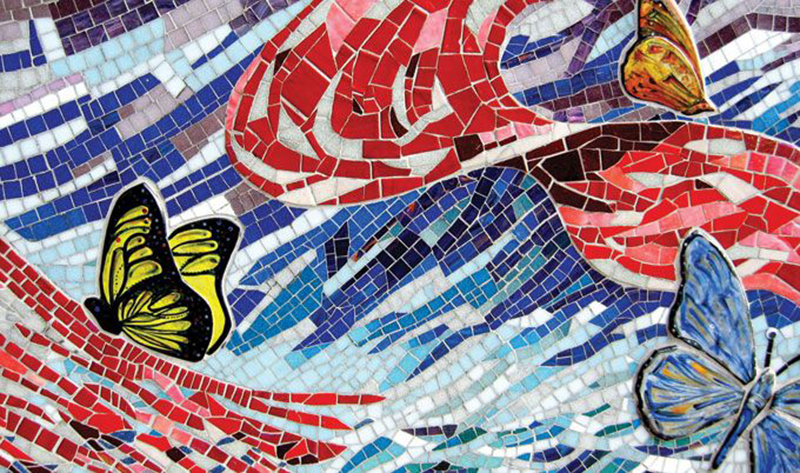 Painting the walls of buildings surrounding the plaza of Caurio, he invited artists from the U.S., Mexico, and Europe to submit butterflies that once attached to the walls serve as veritable protagonists of a process of circular migration.